Lanyon Quoit is perhaps the best known and most photographed of any of Cornwall’s prehistoric monuments – but it also unfortunately one of the least authentic! 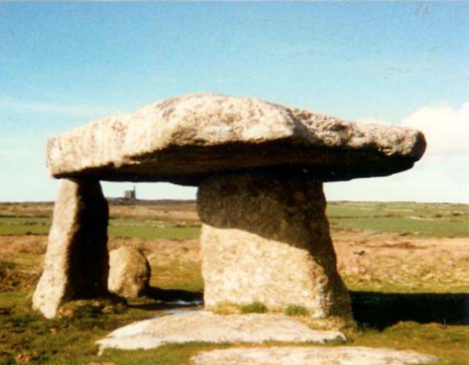 It originally dated from the early Neolithic period (3500-2500 BCE) and consisted a large capstone 5.3m (171⁄2ft) long and 2.7m (9ft) wide on 4 upright support stones, similar to Chûn Quoit on the moors to the west [available as a downloadable leaflet]. However, in 1815 it collapsed in a storm and some stones were fractured, so that when it was re-erected in 1824 (at right angles to its original position) the capstone was placed on only 3 uprights which were shortened and squared off. It is thus much lower than before, and does not retain the distinctive rectangular box-like appearance of other Quoits. It originally stood at the northern end of a burial mound 27m (90ft) long and 12m (40ft) broad, the outline of which is still visible. At the southern end is a collection of stones which may originally have formed a small chamber or cist. In the 18th century Dr.Borlase dug at the site and reported that between the support stoones, he had found a grave containing ‘black earth’. Lanyon Quoit is located on relatively low-lying land close to Lanyon Farm, beside the Penzance-Madron-Morvah road. The site is owned and maintained by the National Trust. There is an area beside the road where one or two cars can park. A stile leads across a Cornish hedge, and the Quoit is a few yards further on. There is no disabled access at present, though discussions are underway to see if it can be provided in the future. Like many other sites, it was previously thought that treasure was buried under the monument, and digging over the years certainly weakened the foundations and probably con- tributed to its collapse. Lanyon is one of a number of quoits (approximately 8) remaining in West Penwith. These sites were probably designed as repositories for the bones of the dead, whose bodies may have been laid out on the capstones for the carrion birds to remove the flesh (a practice known as excarnation). Yet it would be a mistake to think of these monuments simply as ‘burial chambers’. The bone evidence from other places indicates that the disarticulated bones of a number of individuals may have been placed inside, and from time to time some bones were removed and were replaced by others. We may perhaps rather think of these sites as places where the tribe (or the shamans of the tribe) would go to consult with the spirits of their dead ancestors in trance journeys and altered states of consciousness.